I was chatting with Brett from Summit Gear about canyoning rope and he mentioned that he had a 60m sample of the new 9mm canyoning rope produced by Edelrid which replaces what was previously a very popular canyoning rope (and one that has served me well). He offered to lend it to me so I could review it over the Easter long-weekend as I was planning a couple canyons. The new design, which is constructed with a nylon sheath and polypropylene core (which makes it float) has come about because the company is one of many outdoor gear manufacturers who have signed up to the Bluesign standard. The basic concept behind Bluesign is to consider the environment, consumer safety, transparency and productivity in textile manufacturing, with members using chemical components with lower ecological and toxicological impacts to replace old materials. For people whose passions involve exploring the outdoors, it is great to know your gear is being manufactured with these principles in mind. The new 9mm Edelrid Canyon rope is about 10 percent lighter than the old model, coming in at a very light 46 grams per metre. The sheath (the outer part that protects the rope) has been thickened slightly and is made of “hard wearing nylon”. The move to a polypropylene core not only allows the rope to float, it also means there is no longer any shrinkage when wet. The rope is also softer, more malleable and easier to knot and work with. Unfortunately not all the changes are good. The rope is now distinctly weaker (the manufacturer says the 9mm should only be used double rope and that you need to buy their 11mm rope if you want to have the option of using single rope technique). In fact, even on two strands the maximum load is lower than the old design. The increased softness and flexibility also has downsides, as the rope now provides much less friction and runs much faster through descenders, even when wet. The rope also seems to be more sensitive to the heat produced by descenders. The manufacturer specifically states that the rope should be wet before use, which isn’t always possible. Considering the sheath melts at 215°C, and the core at 160°C, you probably don’t want to be doing any really huge, dry descents on this stuff! The rope is also now much more elastic, with the static elongation increasing to 5 percent. This is a lot for a supposedly static rope. (The old rope was only 4.2%, which is still more than many other brands). The manufacturer actually describes this rope as a “semi-static” rope, which should give an idea of how great the stretch is. Considering this stuff retails for about $6 a metre in Australia, which puts it the pricier end of the spectrum, it would want to work bloody well. The rope I was reviewing had already done about half-a-dozen canyons with a few local guides, so it was not brand new. Overall it looked in great condition, but was starting to get a little fluffy in a few sections where the sheath had been worn by abrasion. This stuff felt great to handle. It was soft, smooth, incredibly malleable, easy to knot, a pleasure to work with and I was really looking forward to using it. The first trial was a rarely visited sandstone canyon off the Kings Tableland. I had no idea what to expect, except that a 45m rope was recommended. Given there is no track, and we were simply aiming for a rough grid reference, we ended up requiring two shortish abseils to get in (the rope was long enough to do it as one, but would have made the pull down difficult). The down-side to this of course was that we were already breaching the manufacturers recommendations by using it dry. It also meant some grit and dirt were getting on it, unlike in a clean wet canyon situation. The first thing we all noticed was that it was fast, very fast. Most of the group of six were using Hydrobots, and we all had to rig them for higher friction. Those with ATC’s noticed less of an issue. Even when it got wet the rope was quick, and I still used the added friction, which I would very rarely do with a wet rope. Otherwise it was a pleasure to rig up and use, being so soft and easy to work with. The bright orange colour was nice (it doesn’t just look nice in photos, it makes it a lot easier to spot the rope and make sure it reaches etc), and the fact that the rope floats meant it was easier to retrieve the loose ends and do the pull down. It is also nice not having to worry about it being dropped into a pool and sinking! I also noticed that the rope stayed very light when wet and it didn’t feel like I had a 60m rope in my pack. I assume this is because the polypropylene core doesn’t absorb any water, unlike many other rope materials. We only ended up using it for two abseils, but I was quite impressed by it. On day two we’d been planning to do a longer, harder canyon, but bad weather meant we had to look for a dryer alternative. 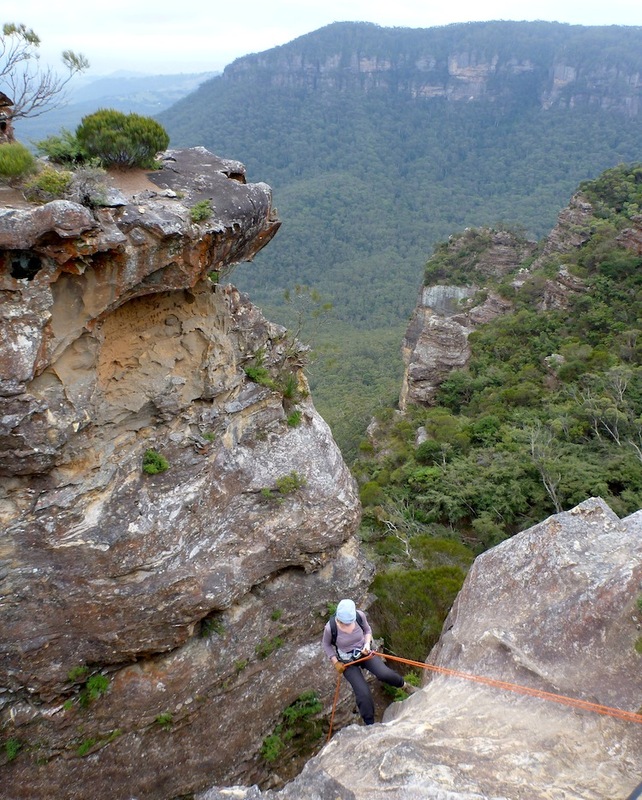 In the end we decided on a set of abseils at Boars Head (5 drops of up to 45m each on abrasive sandstone) into the Megalong Valley. For one of the drops we would need two ropes, so it was also a chance to use it side-by-side with another brand. The rope started off wet (it was still damp from the day before) as we set off down the first 20m drop. I went down as the last of the group of eight, and despite being the first abseil I was already starting to notice a strange build-up of orange fur on my descender. I’m not sure why, but the sheath seemed to be suffering a lot of wear. Each drop was the same, with everyone noticing a small amount of orange fluff at the end of each drop. The rope was also visibly deteriorating after the longer drops, with the areas that were rubbing against against the rough rock becoming quite puffy. By the final, big 45m drop I was starting to wonder if the Hydrobots were to blame (I’ve never had this issue with them), so I was curious how the dry Tendon 9mm would respond. At the bottom I only had fluff on one side of the descender, and it was orange! I have no idea why the wear on this rope seemed to be so severe, but I do wonder whether it is like many European canyoning items that are designed and tested on smooth limestone and granite, which is much more gentle on rope than the harsh sandstone you get in places like Australia and the United States. My original plan had been to take this rope out again the following weekend, but after this trip I wasn’t keen to do another set of big drops, given the rate of deterioration of the sheath. Back at home I also decided to weigh it, and see how light it remained when wet. It is a little inaccurate, given I was issuing a washing basket on top of some electronic kitchen scales, but it did give an idea. It was also a little inaccurate because the rope was clearly longer than 60m (several metres longer when used side by side with another 60m rope). Dry (well air dry, a few days after the trip), it came in at about 52g per metre (based on the assumption it was a 60m rope). Once wet it was only 56g (I only gave it a minute for the excess water to run off). That seemed a pretty extraordinary result; a weight gain of less than 8 percent when wet. If you’re an occasional canyoner doing wet canyons with nice, clean drops and not too many abseils, this rope could be really good for you. It is lightweight and very easy to work with, it floats, and it doesn’t get heavy when wet. However if like me you are a heavy user of your ropes, and take them through canyons with many large drops which are at times dry, I’d probably steer clear. It is interesting to note that ropes designed for more abrasive activities like caving generally have more tightly woven sheaths and are stiffer and more difficult to work with. For sandstone canyons, which are also very abrasive, this is probably worth taking into account, so by sticking with ropes that are harder to knot, coil and generally work with you will probably end up with something longer lasting. The amount of elasticity in the Edelrid rope is also far too high. On long drops this creates a lot of bounce, and especially where an anchor point is well back from the edge this means a lot of rubbing that will cause serious wear to the rope. While I almost exclusively abseil on double ropes, I have abseiled on single strands and like the flexibility of being able to do that on my standard canyoning rope. I am certainly not willing to lug about an 11mm rope to do so! While it is commendable that Edelrid and other companies are moving towards more sustainable and environmentally manufacturing techniques, in this case I think they have failed, instead producing an inferior product which is weaker and poorer wearing than its predecessor. While it is lighter, less absorbant and has a thicker sheath, I don’t think it stacks up, and certainly not at such a high retail price (about 25% more expensive than some similar ropes). P.S. On a complete aside, doing some research on canyoning ropes made me realise how much older ropes can shrink with age and use (water being the main culprit), which is something that is worth considering if you’re planning to do a drop where the rope only just reaches!